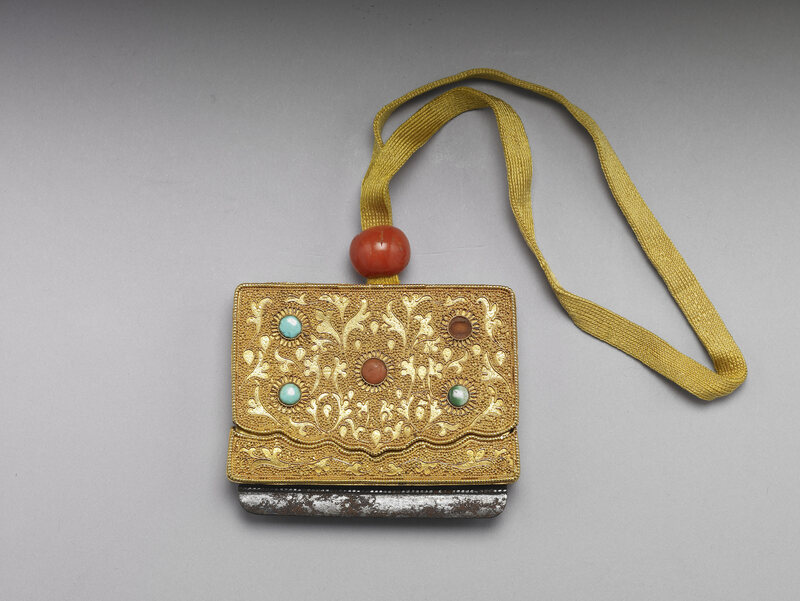 This gold gilt rectangular box-shaped case has thin iron plates inlaid at bottom. 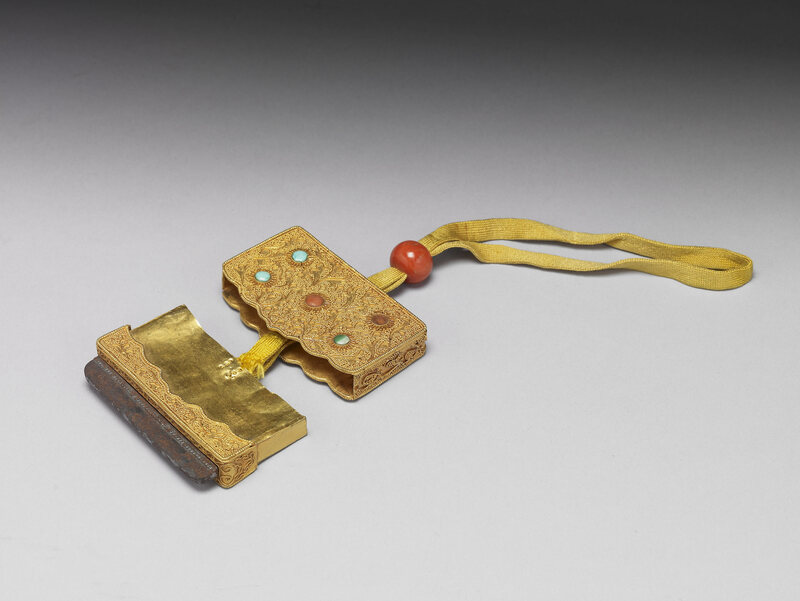 Upon releasing the coral knob at the top, the case can be opened to reveal a long, narrow interior container made of thin gold plate, in which the flint and tinder were stored. Sparks for fire were produced by striking the flint against the inlaid iron plates, and such flint cases were a common accessory worn about the waist by Qing dynasty men, with a role akin to that of the modern-day lighter. For the Manchu imperial family and nobility, who had their origins in the steppes of Manchuria and continued to preserve a martial tradition of horsemanship, archery, and hunting, the wearing of a flint case or pouch-shaped fire bag or flint pouch not only had practical purposes, but also served as a reminder of their ancestry, traditional customs, and origins. Besides metal, flint cases could also be sewn from embroidered fabric, or carved from ivory or rhinoceros horn. The surface of this case is decorated with flowing cloud and scattered flower patterns interspersed with tiny round gold beads, produced by hammering, cloisonné, and soldering techniques; while the edges of the surface are chased with a braided rope pattern. The top and bottom edges of the case lid are marked by ruyi head patterns inset with beads, with delicate flowing lines resembling silken embroidery. Red coral and green turquoise have been inlaid at the center of the floral patterns adorning the surface of the case lid. 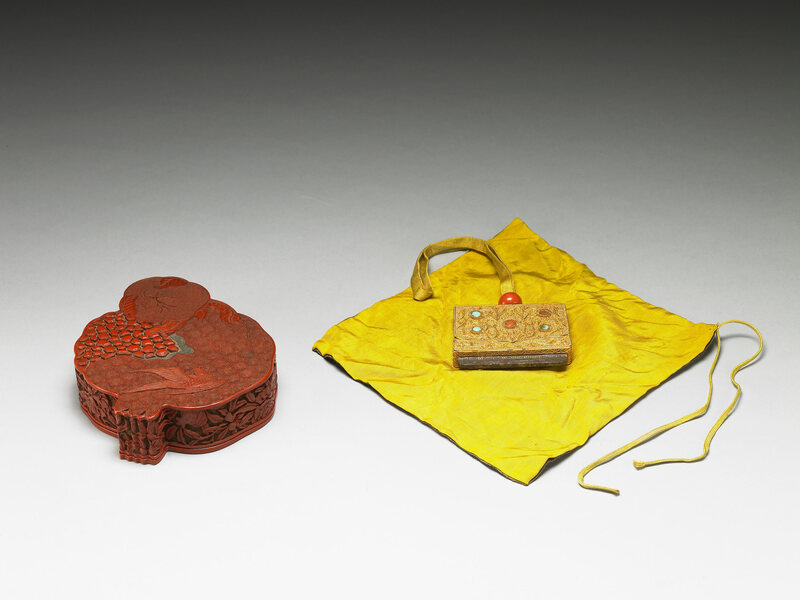 This flint case displays superb craftsmanship, and was further paired with a coiled dragon pattern silk wrapper and a carved lacquer box in the shape of a pomegranate bearing the seal of the Emperor Qianlong, all three of which were stored in a treasure box at the Hall of Mental Cultivation in the Qing Imperial Palace, and were therefore most likely special treasures reserved for the emperor’s personal use.